One indispensable contribution birds have made to our civilization was to provide quills (right) for writing. The central quill of a large / feather, usually from a goose, was trimmed f with a penknife and the point sharpened and split to form a nib. The hollow quill is ideally suited for holding, the ink. New Jersey, Point Pelee in Ontario, and southeastern Arizona. Birding in the USA alone ^^ is a $20 billion a year industry. 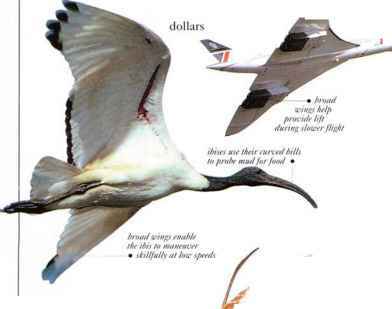 AiKraft are vast/v superior to birds in power, speed, and range, but birds are much more maneuverabte. Ilirds, for instance, do not need a runway to tab off or land. ^smT* An ostrich provided the plume for this cavalry helmet (below right), while the whole design bears a striking resemblance to the head plumage of a bird, such as the Royal Flycatcher^ (below). In the flycatcher, however, the crest is aligned sideways, rather than front to back. For many cultures, birds are an integral part of the social fabric, playing a part in folklore, art, and religion. In South America, for example, feathers arc an essential feature of ritual garments; they show membership and status in social groups and provide a sense of spiritual identity and protection. Kconomic and Social Value liirds also supply our most basic-needs: food, tools, and clothing. Domesticated birds (and their eggs) arc the basis of our poultry industry. 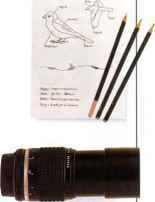 We have used bird feathers for quill pens and fletched arrows and as insulation in goose-down coats and comforters. Birds have also catalyzed scientific discovery: their study has helped us to understand the physics of flight. The canary in the coal mine has a new equivalent - birds are indicators of the health of our environment. The decline of our migratory songbirds increased efforts to protect habitat in their breeding, stopover, and wintering areas. Many people keep birds as pets. Parrots, Cockatiels, and other unusual species provide bird lovers with colorful anil vocal companionship at home. The ancient art of falconry remains popular, and falconers' knowledge of the rearing of birds of prey has assisted in the réintroduction of threatened and endangered species into natural habitats. Birds bring us wonder, mystery, and pleasure. In their limitless variety of color, song, and behavior, birds embody a magic that we may celebrate, but only they can possess. Research Associate, Department of (Ornithology, Academy of Natural Sciences of Philadelphia. Except when stated otherwise, the photograph in each entry shows the adult male. Many birds also have other plumages (see f>f>. 12-/3), and the most important of these are illustrated beside the photograph. 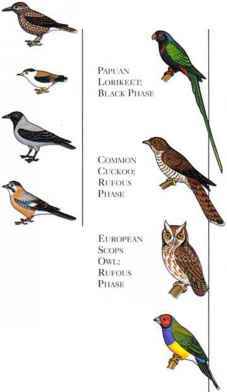 These show where the bird is likely to be seen, either all year round or at certain times, l or example. Purple Martins breed in North America and winter in Brazil; the map also shows the area through which they migrate. By contrast, in the western part of their range, European Robins stay all year, but in the east they are migrants. The Australian Brush-Turkey is a non-migrant, remaining in the same area all year round. related birds arc placed near each other. Readers can find a bird by its habitat and behavior in the Identification Key on pages 18-37, or by its scientific or common name in the Index. 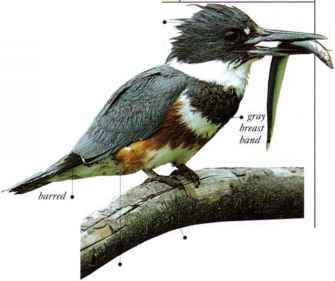 Each entry covers appearance, habitat, food, nest, and distribution, thus giving the most basic identification features. In many entries, additional details, such as song, calls, or behavior, are provided. These show the bird next to a copy of this book. For reasons of space, birds above 20 in (50 cm) long are shown in a smaller scale, so that the book appears in two different sizes. All birds arc measured fully stretched r*5! out, from beak to tail tip. 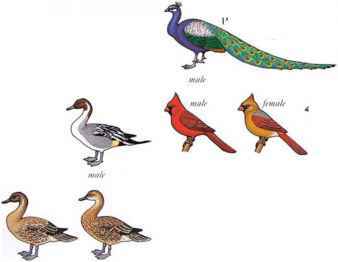 In species in which male and female look different, the male is illustrated. So named liecausc of its black-and>w line, barred tail. this species lues in semidescrt areas near water, feeding on seeds. It i\ seen in lively flocks which utter short. • M ST A »Ionic of gfjs\ with a side entrance, in .1 hush or hollow blanch. • DISTRIBUTION K. Indones. jikI much l>ISTMIHl*TI<i\ of Australia. I his hrownish gray little finch is identified by two bl.uk hands across its hrca-wt Small parties Iced in short grass or on lure ground, always close to cover, taking small seeds. • \I-ST A horizontal, Ivutle-shapcd nest made of dried grass, lined with finer crass, and placed in a ■»null bush or in tall grass. • NEST A mund nest of grass w ith a side entrance, usually in a cavity or rcccss. or under an overhanging clunip of grass. • DlSTKIHI TION New Caledonia. Biros ark animals that can fly, and virtually every feature of a bird shows that it is highly adapted to this purpose. The body is short, strong, and compact, the internal organs being protected by the breastbone and the pelvis. The breastbone is broad and flattened to carry large flight muscles. The legs are strong and springy and are muscular at the point where they join the body. They must provide the push for takeoff and cushion the shock on landing. 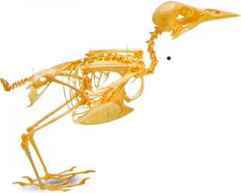 Anatomically, a bird's wings correspond to human hands, but most of the "finger" bones are absent in birds. The wings carry the large fans of feathers used in flight but folded away when at rest. Since a bird has no hands, its bill must be adapted for all feeding. The tail has evolved into a short row of bones carrying the large, adjustable fan of tail feathers. A typical bird has a neat, streamlined shape, formed with its feather-covered body and wings; its bill is covered by a hard sheath, and it has bare, scale-covered legs and feet. The skeleton has a thinner structure and is lightly made to aid flight. The bill lacks the smooth sheath of the living bird, and the wings anil tail look short and bony. The shape of a bird and of its various parts are clues to the way in which it lives. The hill, for instance, is always very precisely adapted to a bird's particular method of feeding. Similarly, a bird's way of flying, standing, or moving on the ground - for instance, whether it hops or walks - are related to its way of life. The way a bird clings to its perch is always closely adapted to its habitat or to the type of vegetation in which it normally lives. 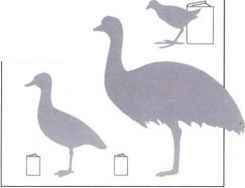 People who watch birds learn to take an interest in shape and movement, as they help indicate the overall category in which to place the bird being watched. 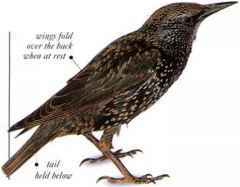 This can be combined with other information to help identify the bird. Look carefully at flight silhouettes: forest raptors (a) a have rounded wings: martins (b) have narrow, b tapering wings. The tapering wings and narrow tail of a falcon (c) c contrast with the broad, splayed wings and broad tail of an eagle (d). Ferns (e) have-long, elegant wings; albatross wings (f) arc very long, with an extended inner section. Look, too, at posture and gait. Some birds like the Reed Warbler (g) cling to vertical stems. Pipits (h) ^ always walk; pittas (i) travel by hops and leaps along the ground. Look for birds that clamber up trees, I using sharp claws, like this trcccrccpcr (I). The Water Rail (m) has long legs and a narrow body for squeezing through marsh vegetation. Many birds, including most finches, perch upright (j) on a level branch. Wagtails (k) run after insects on the ground, using their tails as rudders or brakes when turning. Asimcciks is a kind of bird, a number of related individuals that can interbreed and produce fertile young. However, there are many species in which the birds do not all look alike. Male and female adults are often differently colored. Young birds look different from adults, which may give them better camouflage or may prevent unnecessary fighting for territory. This page shows how "family members" (male, female, and juvenile) can look different; the page opposite shows other ways in which a species can vary: it may have subspecies (local forms) or two or more color phases. Juvenile looks similar to the female but is duller, as in the Northern Cardinal (above). Sexes alike: the Cape Grassbird (right) is an example. Males often have a different song. Pattern similar but male has brighter hues than female, as in the Eurasian Bullfinch (right). Pattern similar but female has brighter hues than male, as in the Eurasian Dotterel (right). Juvenile is totally unlike the adult, as in the Black-crowned Niglit-I Icron (right) anil main other herons. Male has a longer tail than the female (often only in breeding birds), as in the Blue eafowl (below ane/ right). Male is significantly larger than female: the Great Bustard (right) is one example. Female is significantly larger than male, as in the Red-tailed I lawk (right) and other birds of prey. subspecies Many spccics have distinct local forms known as subspecies. These look different from one another, though often in only a minor way. They can be distinguished by color, size, song, or sometimes by features like bill shape or tail length. In some species, differently colored individuals occur, regardless of geographical area, like the white and blue color phases of the Snow Goose. BIKE) WATCHING, OR BIRDING, usually begins at home. In any garden or yard, there are bound to be a number of birds that arc already present; it doesn't take much work to adapt a garden so that it offers the best for birds and brings in more than the usual handful of species. Some things are particularly likely to attract birds: water, both for drinking and bathing; maximum variety in the habitats available; providing possible nest sites; and offering food, at the appropriate time and in the appropriate way. Birds that use nest boxes range in size from passerines, like chickadees, robins, and nuthatches, to some ducks and birds of prey. Boxes shown here arc for small passerines; other species need boxes of different sizes and designs. In colder climates, many people build food tables to feed birds in winter. This prevents food from being lost in the snow or taken by scavengers. Shown here are two views of a simple table that can be made at home. 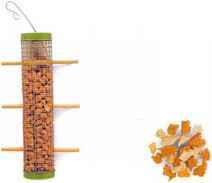 Many passerines like water to be provided in a raised site, such as a bird table. Other birds prefer to drink from a shallow pool on the ground, with good all-round visibility. Lightweight types are the most practical, with magnifications of 7 to 10. With higher powers, you may spend too long aiming and focusing. The most suitable type of camera for photographing birds is a 35 mm SLR model. Practice on garden birds first, to acquire the skills of judging distance, focusing in the time available, and steadying the camera for the shot. looking carefully at the shapes and colors of birds and to watching their actions. The type of habitat in which the birds occur, their location (such as whether high or low in the trees, or down on the ground), and any vocalizations thev make arc all useful clues. Make notes of what you sec, or even a fast skctch; there is no better way to train your eye for detail. A notebook also provides a record of the birds you have seen and forms a log of activities, which will help in planning future trips. (200 mm focal length or more) and, for best results, a tripod to keep it steady. Birds are often alarmed at the sight of people, but if you hide behind or within a simple structure they will soon forget your presence and go about their business. A temporary, movable blind can be made by camouflaging a simple tent with branches and leaves (above left). A parked car (left) is a very effective blind, as the birds usually fail to realize that it contains humans. Large blinds, often seen in nature reserves for wildfowl, can accommodatc many visitors. 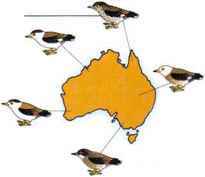 Remember that birds breeding arc birds sensitive to disturbance. Nothing should be done that frightens them or alters the surroundings of their nests. Once frightened, they may abandon the nest, which could set their breeding back a whole year.